By Bob Sperber for Pharmaceutical Commerce. The reelection of Pres. Barack Obama assured that the Patient Protection and Affordable Care Act (PPACA or ACA), signed into law on March 23, 2010, will move forward, and with it, the Physician Payment Sunshine Act provisions. It goes by lots of names. Officially named the Transparency Reports and Reporting of Physician Ownership or Investment Interests section, it also goes by the “Sunshine Act,” aggregate spend law or simply “agg spend.” By any name, it will require pharma, device and medical supply manufacturers to submit reports of spending on physicians and teaching hospitals to a database maintained by the Centers for Medicare and Medicaid Services (CMS). Reports must include “payment or other transfers of value” (POTVs) exceeding $10 for everything from small meals to consulting fees, to speaking and research fees, to stock ownership. Manufacturers can’t begin collecting data for strict compliance until the final rule is published. The latest news at presstime is that CMS completed the final rule, and on Nov. 27, sent it to the White House Office of Management and Budget for review. Expectations are that within 90 days of OMB’s receipt, CMS rule will be issued as final. If so, manufacturers could be required to begin data gathering on Monday, Feb. 25, 2013, for their 2014 agg spend report submissions. Most manufacturers already have some program in place to meet the reporting requirements of several US states—Minnesota, Colorado and several New England states, among others. Comparable reporting requirements are coming into force in the European Union, and some companies are attempting to build a global reporting database to meet current or future requirements worldwide. Not knowing exactly how CMS will incorporate industry comments into the final rule, companies remain fearful over the many yet-unknowns, from dates to data points. One big issue: “context.” Under the proposed law, when a manufacturer reports a research grant to a teaching hospital, it includes total dollar amount and other identifiers, including the identity of the principal investigator. Of course, the investigator doesn’t get the money, the institution does, “and that institution has to pay 50 people, run a laboratory, do patient testing, and all kinds of other things with that money to conduct that clinical trial,” says Marjorie Powell, senior assistant and general counsel with the Pharmaceutical Research and Manufacturers of America (PhRMA), which has lobbied to add clear, nontechnical explanations to public spend reports. 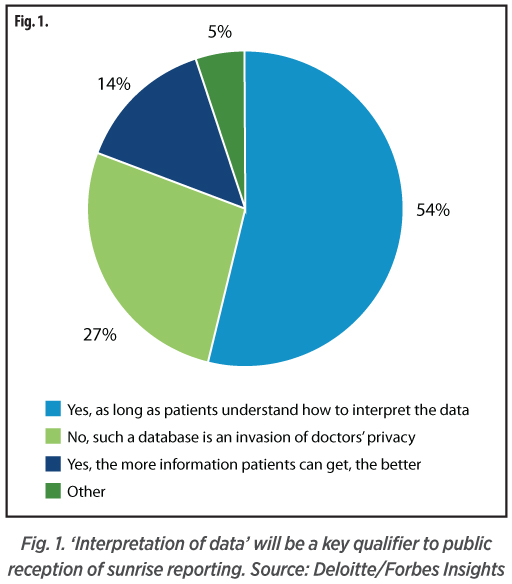 Asked whether they favor a public, searchable database of all physician-industry relationships, a 2012 survey of 110 US-based physicians and 223 executives from life sciences companies, conducted for Deloitte by Forbes Insights, found that 68% were, most of them agreeing “as long as patients understand how to interpret the data” (Fig. 1). The last point speaks directly to the issue of context. State regulations add further complexity. The federal law will set the baseline, but states are free to enact further restrictions. Massachusetts and Vermont ban spending on gifts; Vermont bans meals and requires reporting on clinical transactions and disclosure of all free product samples that do not apply under Section 6004 of the ACA. Minnesota maintains spending limits, which the federal proposal does not. Massachusetts, Washington, D.C., West Virginia and Colorado also have state agg spend laws. There are signs that some of these and perhaps the rest of the states are looking forward to letting Uncle Sam do the bulk of the heavy lifting. Maine had a law, but repealed it on June 29. Massachusetts eased restrictions a month later and partially repealed its 2008 Pharmaceutical and Medical Device Manufacturer Code of Conduct, then in September, issued an “emergency regulation” to address a legislative change “to allow companies to provide ‘modest meals’ to physicians outside of their offices as part of an educational event, such as a speaker program or conference seminar,” says PhRMA’s Powell. Another area of ambiguity is the very fundamental identification of physicians. CMS expects healthcare providers (HCPs) to be identified by their National Provider Identification (NPI) number, but not all doctors have one because it’s limited to physicians serving federally funded insurance programs. “So, a plastic surgeon doing cosmetic surgery, for instance, wouldn’t be in the Medicare or Medicaid system,” says Bill Buzzeo, GM of global compliance solutions at Cegedim Relationship Management (Bedminster, NJ). For Bristol-Myers Squibb (BMS), the key to a successful compliance solution is “thinking of the project as a business problem in terms of process and not necessarily as an IT or system solution first,” Antionette Brock, director of business projects & planning, told attendees at a June user conference held by IT vendor Pegasystems (Cambridge, MA). The company’s system establishes a single set of processes, common roles/rights workflows and procedures that will ultimately roll out across global operations. The company shared its challenges: underestimation of time and cost; the need to navigate competing priorities; team member “swapping”; training and the sheer number of integration points. These included 11 internal systems (e.g., master database of item costs, global product master data, geographic data), as well as five, which were external vendor systems (e.g., the logistics, T&E and other vendors). Regardless of the IT architecture, “all companies will need to capture data out of these systems and ultimately aggregate it into one reporting solution,” he adds. For its system, Sanofi chose a major vendor to remotely host and maintain data and the application. Users access it through secure Internet connections. There are many paths to compliance. The most common method, IT-wise, is to minimize the investment with a manual spreadsheet-based system, followed by in-house applications, third-party solutions, and then sheet avoidance or noncompliance, Cegedim research indicates (Fig. 2). Many companies often start with HCP lists from one or more vendors (e.g., Cegedim, MedPro, Health Market Science) to complete their existing databases; 47% of company data come from third parties per Cegedim research. Many such vendors also partner with other firms to offer full compliance reporting, validation and software solutions. For instance, MedPro has partnered with Porzio Life Sciences Services and an allied law firm to offer a full software-and-regulatory solution. In terms of third-party offerings, these can be based in-house or outsourced via SaaS to a provider who will keep data and systems up-to-date as regulations evolve. R-Squared (Princeton, NJ) is an example of a vendor that offers systems both in-house and remote. AdvantageMS (Fort Washington, PA) combines its verified HCP databases with a partnership with Concur Technologies (Redmond, WA), whose travel and expense-management solutions are widely used by sales organizations. Compliance Implementation Services (Media, PA) provides consulting on setting up and administering agg spend systems. 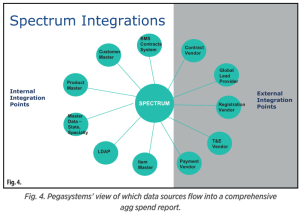 According to Acquis Consulting Group (New York), roughly 80% of HCP transactions are recorded in the expense system, but these comprise only 20% of the total HCP spend. This underscores the need to integrate many systems from many departments, including finance, compliance, legal, IT, sales and marketing meetings and events, and travel departments. Not only do systems from these departments need to be integrated into a single reporting database, companies need to have a clear road map for doing so, from the top down. A steering committee must identify a project leader, who must assemble a cross-functional team, which must develop clear departmental business processes, all the while working with IT to ensure that standard terminology, codes and other details are used. The right data from the right systems in the right departments must be mapped into a unified whole. Once a system is in place, a system should let users link a transaction directly to one or more physician records by selecting the appropriate attendees when planning an event, for instance, as well as inputting details needed to list expenses and exporting the relevant data to a unified agg spend data warehouse. Besides giving manufacturers a better view of their own spending limits, public reporting of data will allow them to track others’ spend data. In fact, they should do this, “because that’s exactly what journalists are going to be doing, and the government’s going to be doing,” says Mandy Klosterman, COO for Regulatory Clinical Research Inc. (Minneapolis), a clinical research organization (CRO) that also provides agg-spend consulting for medical device development. If, for example, Big Pharma Company A is spending $5,000 a year per physician, Company B is spending $50,000, and Company C is spending $500,000—and you’re with Company C—you can expect to get some attention in the media and by the government, and not the kind you want. Aside from sizing up the competition, there are additional areas where the cost of compliance can be at least partially mitigated, however, there are limits to expense-targeting. The American Medical Assn. voiced concerns at and since a Sept. 12, 2012, Senate roundtable discussion, chiefly that the public will mistake the agg spend law for a regulation on ethical conduct rather than simply an accounting of industry practices, and also that the proposed rule “would deny physicians due process to review, dispute and correct inaccurate reporting,” wrote James Madara, AMA CEO, to CMS Administrator Marilyn Tavenner on Oct. 10. As it stands, manufacturers have a 45-day window to make corrections after submitting reports. CMS suggests—but doesn’t require—that they allow physicians access during this period or perhaps earlier in a “pre-submission review.” But how? The options generally focus on some type of secure Web portal that lets physicians log in to verify what goes into reports. A single portal would be ideal for the manufacturer. BMS designed such a portal into its system as early as 2010, when one source at a company presentation noted how the effort “takes a lot of manpower,” including setting up a call center, a mechanism for sending letters inviting the doctor to come online and review reports, and hiring a staff of case managers. If companies face challenges with single-country databases and systems, that’s not stopping leading companies planning regional solutions for the Americas, EMEA (Europe, Middle East and Africa) and Asia-Pacific. A “few true, groundbreaking leaders,” Cegedim’s Buzzeo says, have committed to global transparency projects. Cegedim’s 2012 industry survey on agg spend found that 87% consider global capabilities when choosing an aggregate spend solution. Success will hinge on a single global, corporate instance for systems, such as enterprise resource planning, travel and entertainment, customer master, and disclosure. Beyond corporate global standards, some hope for globalization of transparency standards. In turn, the European Federation of Pharmaceutical Industries and Associations has begun a multinational initiative that targets spend reporting as early as 2016. If it succeeds, it could pave the way for global standards harmonization, which “may prove more elusive than the lost city of Atlantis,” says IDC’s Newmark. Such utopian standards are worthy of support; however, for the time being, the US industry is still preoccupied with investing in systems to comply with a law that has yet to be published. Posted in Healthcare, How stuff's marketed. By Bob Sperber; posted @ Pharmaceutical Commerce. While sampling has been the traditional method of getting patients to try new therapies, the use of coupons or vouchers—often targeted directly to consumers rather than physicians—are on the increase. ” target=”_blank”>In these difficult economic times, such financial incentives are attracting more consumer interest, and the availability of these consumer discounts is being magnified by Web-based promotions in addition to conventional print media. In parallel, coupons and vouchers are demonstrating value in raising or maintaining patient adherence to therapy—a good thing from most healthcare payers’ perspective—but are attracting more criticism from them when the incentives are plainly directly at countering higher-co-pay, higher-cost second- or third-tier formulary positions. The contention is that pharma marketers are circumventing the plans’ goals in steering patients to lower-cost drugs. IMS Health told the New York Times, in an article published at the beginning of this year, that use of coupon programs has tripled since 2006. Coupon programs are even figuring in pharma companies’ Wall Street presentations: during J&J’s quarterly conference call in October, CFO Dominic Caruso told analysts that, in order to recover lost market share from its recent product recalls and competition from private-label OTC products, “our marketers are very good at knowing what they need to do to attract consumers [with] a mix of brand marketing and expenses, couponing, innovation, etc.—a surround-sound impact to get consumers back,” according to Bloomberg News. Paul Kandle, VP and GM of Opus Health, a division of Cegedim Relationship Management (Bedminster, NJ). Opus was one of the first companies to capitalize on the “secondary adjudication” steps that were put into claims-processing systems at pharmacies, once a copay had to be linked not only with a specific health plan, but also with the identity of the drug being prescribed. Since then, it has run over 1,000 programs for manufacturers, and says that it has 250 programs currently. “These claims-processing systems allow manufacturers to overcome two obstacles to patient assistance: the complexity and difficulty of getting samples into the hands of patients after a prescription has been written, and the ability to provide a refund at the point of sale, rather than taking actions like mailing a coupon and receipt into a fulfillment center.” Vouchers (which figure primarily in getting free samples dispensed) enable the prescription to be filled at the pharmacy—and to be documented in the claims processing system—as opposed to being handed out by the physician; however, Kandle notes that there is still a perceived value by physicians in being able to hand out a sample directly. On the copay side, the original need was to ensure that the pharmacist “would be made whole” financially if a discount on a copay were transacted; the secondary adjudication ensures that that happens. As these details were worked out, the overall economics of running coupon and voucher programs became more positive. Still, with the downturn in the economy and years of pharmaceutical mergers, prescription drug manufacturers are “looking for ways to do more with less. And because there are fewer reps out there, there’s less sampling going on than in the past,” says John Khantzian, senior principal, LifeLink Solutions, IMS Health (www.imshealth.com), Danbury, CT. “And where that sampling that does still exist, it’s being done based on priorities developed through physician and patient segmentation analyses.” So, for example, if there’s a managed care influence in a certain area, the manufacturer may modify their sampling tactics based on its formulary status. This helps to ensure that the physician will have its drugs on hand in the sample closet to provide until the patient fills an initial prescription. While hand-delivered samples still dominate according to the TGaS study, those sampled – primarily drug-makers sample-accountability and PDMA compliance professionals – are also exploring other options at high levels: 90% of respondents use coupons; 76% use vouchers; 24% use a pre-paid card; and 17% offer co-pay assistance. The most confusing aspect of analyzing these results is trying to discern the definitions of these vehicles – something that won’t soon be answered. “There aren’t any consistent definitions across the board for coupons, vouchers, pre-paid cards and co-pay cards,” Sharp concedes. As a result, the survey listed those promotional options and asked respondents to check which method they used. On on end of the spectrum are one-time free trials; on the other are longer-term co-pay-assist card programs that foster loyalty. Given these parameters, it may be possible to discern what promotional vehicle works best for the drug maker-marketer. • A free-trial voucher program for one free prescription fill. The objectives of the three programs were to increase the flow of new-to-brand patients and drive brand loyalty. Patients selected were new to the brand, either newly diagnosed or switched from other medications) The result? Multi-use program patients purchased 61% more pills over a six month observation period, while limited-use savings card program patients purchased 28% more pills than the control group. Interestingly, the free-trial voucher program resulted in lower sales than the control program. The drug may have carried unwanted side effects, but such speculation fell outside of the research, says Greg Mastrogiovanni, engagement manager, Commercial Services, IMS Health. He avoids such speculation, offering that this isn’t an uncommon occurrence, and that “a good percentage of patients try the product once because its free but never convert to paid therapy.” Beyond that, he didn’t speculate on why those who tried the free trial didn’t continue on the drug as often as the control group. While pharma companies factor in costs, and ROI in promotional vehicles remain confidential to the brand, “The measurements around them – how they’re distributed and the ancillary materials – can be so remarkably, incredibly different,” says Tom Foley, director of business development for RxHope, one of the integrated multi-channel sampling and marketing companies of Triplefin (www.wearetriplefin.com), Cincinnati, OH. He says no “one size fits all” strategy can be applied to define a media mix or ROI; an osteoporosis drug for elderly women won’t use the same mix of tools and media as an erectile dysfunction drug; likewise, how a co-pay card or free trial will work depends on the drug, the patient population and when and how it’s deployed in the lifecycle. Ned Finn, VP pharmacy at Inmar Corp. (www.inmar.com, Winston-Salem, NC), notes that coupon programs vary not only by therapeutic area, but also by the healthcare objective. “To drive better patient adherence, it may make sense to provide coupons to reduce copay for patients that have proven adherent to therapy. This can have a huge impact on patient clinical outcomes. If the goal is to cross-promote, there are opportunities to use coupons to promote OTC therapies or foods that address the side effects experienced by patients taking prescription drugs for specific health conditions. For example, an online coupon for moisturizers could be offered to someone searching for information on ways to manage side effects of chemotherapy; an online coupon could be offered for foods that address specific health conditions or lifestyle products such as smoking cessation products.” The company, which handles the equivalent of over $6 billion in coupons annually from a wide variety of consumer-goods companies, prints, distributes and then reimburses for coupons used in print media and online. Opus Health, Knipper, Triplefin, Inmar and companies like PSK&W (www.pskw.com, Bedminster, NJ), Trialcard (www.trialcard.com, Cary, NC), Group DCA (www.groupdca.com, Parsippany, NJ) offer a variety of platforms and programs directed at consumers. Programs have evolved from distributing paper coupons to online, print-on-demand coupons, or loyalty cards that are used at the retail pharmacy to obtain an on-the-spot discount for copays. PSK&W has built out a system that integrates coupon distribution with relationship management tools (the DIVO platform) that it says provides a more complete interaction with patients. Most recently, the company linked up with HealthPrize, which is applying gaming technology to the patient adherence problem (Pharmaceutical Commerce, July/Aug 2010, p. 8) to power up its adherence offering. Meanwhile, the growth of electronic health record (EHR) and e-prescribing systems at doctors’ offices and pharmacies is creating a new channel for electronic couponing. OptimizeRx Corp. (www.optimizerxcorp.com; Rochester, MI), now about a year old, is hoping to ride the EHR wave by integrating sampling and coupon programs with these e-prescribing systems, and has a partnership with Allscripts (Chicago) to bring pharma manufacturers’ programs into that channel. The company says that it has processed almost 70,000 coupons in the past year. Medicare and other government-funded programs are ineligible for coupon programs, but Medicare Part D, and its infamous “doughnut hole” that requires patient payment up to a set level annually, has created an opportunity for patients. In helping to subsidize prescription drug costs by mandating a secondary payer field in the electronic claims process, the theory goes, Part D “gave manufacturers greater ability to offer financial assistance with new immediacy,” says Rick Randell, president of Triplefin’s National Patient Services (NPS). Because in contrast to old-fashioned snail-mail vouchers and the like, “the immediacy of on-the-spot secondary payer discounts at the pharmacy, and access to current multi-channel technology services, gave manufacturers the ability to finally make offers they needed to offset the expenses of being a non-formulary product, right at the point of sale.” While vouchers, coupons, co-pay cards and the like were already gaining popularity, the secondary payer field could be used not just for Medicare but for all transactions (Fig. 2). Likewise, a website isn’t a website anymore. Beyond static display of information or perhaps printable coupons, brand sites can serving much of the informational role today as family doctors and neighborhood pharmacists did in days of yore. 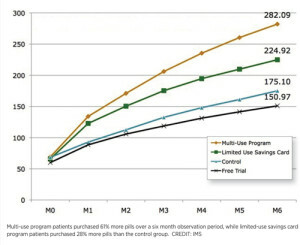 For example, Eli Lilly and Co.’s site for Effient (http://www.effient.com), for instance, offers a plain-English Esstential Habits program to help patients with stents adjust their diets and lifestyles in addition to offering a card that covers the portion of a patient’s co-pay over $25 up to a maximum of $20 each for the next 11 refills. And Bristol-Myers Squibb’s website for Abilify (www.abilify.com), a treatment for depression, bipolar disorder and schizophrenia, guides visitors to identify the disorder for which they’re interested, state their informational needs as a patient, caregiver or information-seeker, and invites them to join its “ABILIFYAssist” (www.abilifyassistprogram.com) program for a free trial and “continued savings” with promotions for the healthcare provider, pharmacist, insured patient and uninsured patient (Fig. 3). Also, there’s a cost-and-coverage calculator, refill reminders and prior authorization assistance where the brand collaborates to help complete documentation and facilitate authorization. In fact, any Internet, communication or media channel can be part of the mix, from TV commercial “ask your doctor” prompts and website “click here to print-out our coupon” features to opt-in email and text messaging elements, even mobile apps, which are emerging. (In September, Triplefin launched a new Innovations Mobile business to fill that need.) For some, this will beat the frustration calling a plan’s phone tree, although even that’s changing as new-generation IVR (interactive voice response) systems offer 24/7 services offering assistance with similar granularity to websites. Given all these content-rich and personally tailored services, patients are much more likely to consider a brand’s value beyond the co-pay to build loyalty, or in the case of free trials, increase the value of the offer due to the trust the marketer builds using all of these technology-assisted services. It’s hard to manage a prescription drug promotional campaign when success when putting the brakes on a promotion can be as important as being proactive to patients’ needs. Viewed from one angle, that’s what happens when a pharma company offers too heavy a discount without offering also-deep discounts to the plans that would rather sell generics. But this is a simplistic view of a much more complicated set of considerations that make promoting prescription drugs a complicated affair. Before the drug-maker can promote its drug, it has to establish its a preferred position in a drug plan by offering a sufficiently large rebate – in plain talk, discount – to pharmacy benefit managers (PBMs). PBMs administer prescription drug plans for patients through the group health plans to which they subscribe through self-funded employer or labor union plans, health insurance plans, and Medicare Part D.
Those rebates act as a discount that’s factored into the formulary process to offset the cost of the drug, and they go “directly to the ultimate payer, such as the employer group, to offset their plan cost,” says Brent Eberle, VP of clinical services for Navitus Health Solutions (www.navitus.com), a PBM based in Madison, WI. Once a manufacturer secures pricing and a preferred (or any) position, it then can turn to promotions such as patient co-pay assistance programs. Unlike samples and free-trial offers that don’t incur costs to anyone but the manufacturer, co-pay discounts are generally disliked by PBMs. The reason simple: A more expensive Tier 3 drug can appear to the patient to cost the same as a preferred Tier 2 drug when in fact its cost to the plan is almost always higher. Eberle says situations like this – aggressive marketing that crosses the formulary line – is “something we factor that into formulary decision making. Integrating coupon/voucher/adherence programs with electronic medical records (EMR) systems will be the next frontier for these programs, says Opus Health’s Kandle. Currently, a contest is being waged between the EMR vendors and the patient-assistance providers over the cost of allowing a presence in the EMR network. At the same time, the EMR vendors are competing for share of mind with physicians and healthcare networks, so there’s going to be some equilibrium to be reached between the cost of having a presence in the network and the value to the EMR vendor for customer acceptance. Posted in Compliance, Healthcare, How stuff's marketed. Take one of the most dynamic transformations in any form of media occurring right now—the rise of social media like Facebook, Twitter and the rest—and factor in that marketing and advertising agencies themselves are heavily vested in exploiting the possibilities of the new, digital cornucopia. Then layer in the reality that almost month by month, the “norms” of social media (if such a concept can be recognized) are changing. Now throw this tidal wave against the careful, deliberate traditions of FDA regulation of healthcare communications. The result: a lot (a LOT!) of sound and fury, but relatively little movement by pharma companies into the social sphere. FDA, without coming right out and saying so, has postponed providing rules on pharmacos’ use of social media (and has indicated that it is likely to provide “guidance” rather than actual rules). In turn, pharma marketing and communications leaders are dabbling around the fringes of the social media movement, while mostly building more websites and buying banners through online marketing networks. Behind the scenes, though, pharmacos appear to be quite active in monitoring online discussions and commentary—itself an evolving type of marketing service for themselves. In 2009, FDA’s Div. of Drug Marketing, Advertising and Communications (DDMAC) held public hearings over online marketing and communications (Pharmaceutical Commerce, Nov/Dec 2009, p. 6), which brought out many thought leaders among online companies, public interest groups and manufacturers. DDMAC hoped to use the commentary to develop communication standards in 2010, but at the end of that year, delayed them to this year. Social media, as such, were somewhat on the periphery then; a lot of the discussion revolved around getting fair balance into banners (which, it turned out, has become fairly easy to do). But one issue that was prominent then—and remains so today—is whether manufacturers are obliged to handle product complaints that might be expressed anywhere on the Web as reportable adverse events (AEs). For now, he says the company is taking a “letter-of-the-law approach,” even he’s left wondering which letters to which laws to follow. Like most pharmacos, Genentech has a public statement of principles, based on parent Roche (see box, p. 34). Most of the rules are not specific to social media, except to note that comments posted in a seemingly local or private site have a way of ricocheting around the world. • Google announced that it was shutting down Google Health, an early effort to get electronic health records (EHRs) organized for consumers; at the same time, it has started up Google+, its answer to Facebook. • Microsoft, which has a service, Health Vault, that competed with Google Health, has gone ahead and acquired FDA registration for the service as a medical device. • Disease-state/therapeutic area Pages that have the PI/ISI on the Page This means that corporate Pages, general disease awareness Pages, and unbranded campaign Pages will have their comments re-enabled for their Walls, photos, and videos. Jonathan Richman, group director of insights and planning at WPP’s interactive agency arm, Possible Worldwide(www.possibleworldwide.com) notes that “whitelisting” will apply and gives a detailed explanation at his blog, www.doseofdigital.com. One of the more recent developments from Radian6 is a partnership with Asentech (http://beta.asentechllc.com), whose new, combined system trolls a claimed 330 million sites every five minutes to offer ratings like other systems, with a difference: The partners have added a staff of physicians and pharmacists to mediate the data for pharma brand manger users before pulling the trigger on weekly or monthly reports. Even companies who shy away from social media due to regulatory fears should still be aware of what people are saying about them. Monitoring, or as some call it, “listening,” assisting companies in their marketing and overall in pharmacovigilance efforts that can help prevent or mitigate situations that can lead to adverse events, improper off-label use and warning letters—whether or not the FDA ever offers guidance or formal rules. Eileen O’Brien, director of search and innovation at siren Interactive (www.sireninteractive.com), a Chicago-based agency specializing in rare disorders, says she was “very optimistic two years ago” that DDMAC would issue guidelines, but is not sure they’re needed today: “We’re still waiting for guidance for using the Internet, but that hasn’t stopped anybody from doing a website.” Pharmacos seem to be coping by following existing guidance for TV and print media promotions. “It’s easy to get distracted by a shiny, new object,” says O’Brien, who stresses that social media aren’t a strategy “but a tactic that has to tie back to larger marketing and brand objectives. It’s not right for every brand.” Companies should first attend to higher-priority interactive tactics such as a creating a compelling, frequently-updated website and search-optimized e-mail campaign that reaches key audiences. In the face of the evolving if amorphous nature of social networking, statistics aren’t everything; even Manhattan Research, a New York market-research company specializing in tracking new media, is sidestepping some of the frothier parts of the social media buzz. Monique Levy, VP of research, says that the firm routinely finds itself doing “a lot of explanation to contextualize the data” revolving around social media activity and that business models are still evolving. For the time being, she says, the more significant activity is focused on mobile technology at a time when consumer and physician mobile apps are surging and the research firm estimates that 91% of US physicians are using some type of smartphone, and that 75% of all physicians own some form of Apple device, such as an iPhone or iPad. The firm is now conducting a study on physicians’ opinions of sales-rep presentations using digital media. Web or mobile Web, there’s plenty of opportunity for pharma social networking despite regulatory restrictions, as hundreds —thousands—of online social connections attest. But where to start? 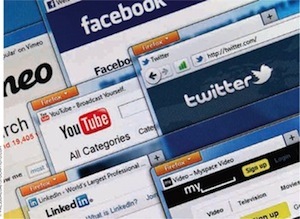 Going forward, social networking may or may not become an easily measured media segment to track. It’s not that market shares and data are top secret, but that it’s difficult to get accurate audience data beyond users and “likes” on publicly accessible sites, or–more importantly—tracking physicians on targeted, registration firewall-protected physician-only sites like Medscape Physician Connect (http://www.medscape.com/connect), Sermo (www.sermo.com) or Ozmosis (www.ozmosis.com), or any of hundreds more health-related venues. User counts don’t measure active users, nor do total user counts for which there’s likely to be plenty of overlap. “A marketer is better off reaching physicians in a closed community because even if they’re on Facebook, they’re not consuming pharma information there,” says Tim Lewis, director of strategy for interactive and relationship management for Chicago-based healthcare agency AbelsonTaylor. Because every rule seems to have an exception, AblesonTaylor has found one group of healthcare providers using Facebook: 2600 night nurses in hospital nurseries who have special needs and can be overlooked in the nursing world. AblesonTaylor created this presence for Abbott’s Similac brand. 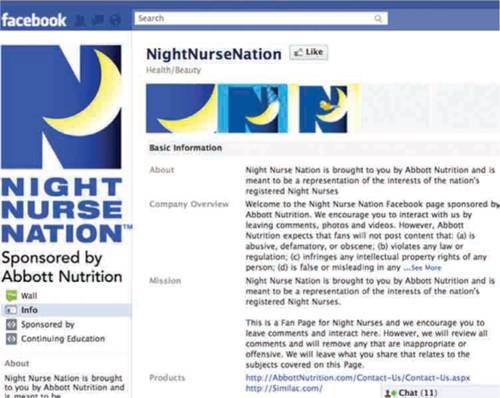 Lewis’ associate, Bekah Locker, manager of social marketing, notes that this is “a community space where night nurses could come together, engage in conversation and connect with each other on topics they find relevant.” Abbott doesn’t push the brand, but has provided “an authentic place for that type of engagement.” The moderator shares relevant information for sleep disorder, working with patients and the challenges of working at night. The same applies to prescription drugs: “One of the easiest ways for a brand to get involved in terms of the social space is to do cause marketing.” Pharma marketers typically gain access, and then only some, on closed physican sites, depending on their level of sponsorship, and so, Lewis says, “it’s harder to have an ongoing dialog [in a closed community that’s sponsored.” That also goes for custom sites and pages created using platforms by custom developers such as within3 (www.within3.com). But opinions diverge on such topics because the “social” market may never be a market segment that can be as easily measured as more monolithic channels. Codified in late 2010, Roche’s guidelines apply worldwide, and are an example of how pharma companies are grappling with the changes in communications media. The company also has a Social Media Advisory Board to address new issues. The following is excerpted from the company’s website, roche.com. 5. Be careful if talking about Roche. Only share publicly available information. You are not allowed to talk about the revenue, future plans, or the share price of Roche as this may have serious legal repercussions for you and the company. 3. Mind copyrights and give credit to the owners. 5. Identify yourself as a representative of Roche. 6. Monitor your relevant social media channels. Make sure you know what is being discussed, so that you can respond when issues arise. Have rules in place to deal with potential Adverse Event reports or potentially inappropriate or illegal content … Also, be mindful of any obligations to preserve data that may be subject to a legal hold. 7. Know and follow record management practices. … Keep records of our interactions in the online social media space. Because online conversations are often fleeting and immediate, it is important for you to keep track of them when you’re officially representing Roche. Posted in Healthcare, How stuff's marketed, Information & Automation.